Hi, my husband is often found working on my car in the lot. The truth is, he isn't much of a mechanic and he couldn't figure out how to fix the brakes. When I press the brake pedal it feels normal like always but the car takes a lot of time to stop. If there is a stop sign I have to press the brake very early. One thing I have noticed he just made the horn louder. Does the brake pedal fade to the floor while trying to stop? Is the fluid full or is it leaking fluid? Have him check the basics in the guides I attached. He checked and the brake fluid is good no leak. He needs to go over it again. You either have a bad master cylinder or air in the system. He needs to go over it again as he is missing something. Yep, thats what I said all along. 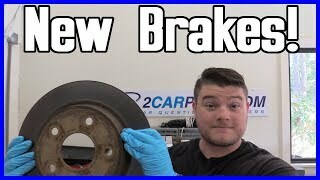 Right now my car is still stopping but will it affect the brakes for a long term? Yes, you need to stop driving it until the air is bled from the system. It is very dangerous to drive that way. Okay. But my husband doesn't know that much in repairing my brakes. And I had to drive the car for two days to work. There is only a garage but its too far and the only way I am driving the car is that I rest my foot on the brake pedal while driving. I don't know what to tell you. You are putting your life and everyone else on the roads live in jeopardy driving it that way. I know. The brakes were repaired 2 weeks ago which cost me quite expensive and were working fine, then 3 days ago before I messaged you the brake problem started again. I don't know how this happened. I thought your husband fixed them? That's where you need someone who knows brake systems look at the car. You need someone with experience to look at the car. I would return to him and have him recheck the system. This is beyond your husband at this point. No, brake pads will not cause this at all. You need to get it pressure bled to get rid of the air. Yeah. This will be done eventually. But how did the problem started after I left the supermarket? Why Abs Is Fleshing When Im Revesing? Abs Goes On When My Car Is On Reverse.